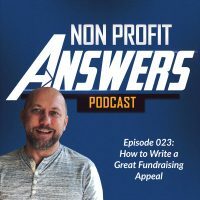 For many nonprofits, fundraising events are a key to their annual development plan. In this episode, I answer a question from a new fundraising professional at a private Christian high school. Planned attendance for their annual fundraising event is down and he’s looking for answers. I explain to him how to discover if there’s a problem, what to say to past attendees to get ask for a gift, how to structure the event for maximum response, and how to get more people to attend.